Designer Phoebe Philo was perhaps the first to spark the sneaker trend among the fashion set when she took her bow at the Celine spring/summer 2011 show in Adidas Stan Smiths. And ever since, the shoe has crossed the feet of many an editor, celeb, and street style star. And if it’s not the Stan Smiths, then it’s the black Nike Frees with the white swoosh. Or, the New Balance 574s. In just a few years, the market has become overly saturated with the same kind of kicks. As major proponents of one-of-a-kind pieces, we took matters into our own hands and test-drove all the ways we could personalize our sneaks. Behold, a round-up of our custom creations that make us and our soles happy. We like to think of them as our very own couture kicks. We’re bringing back our favorite shell toe sneaks—we especially loved the metallic accents and colorful stripes. Customize your Adidas Superstars: $110; adidas.com. We were more than impressed with the bevy of colors. The 574s are broken up into 11 different fragments, from the saddle to the heel tab, and you can color-custom each one. Customize your New Balance 574: $160; newbalance.com. Converse offers more than just a plethora of colors, prints, and embroidery, the All Star brand also gives you the option of stamping your name or word onto the inner body of the shoe. Customize your Converse Chuck Taylor high-tops: $75; converse.com. It was hard to choose which Nike sneaker to customize—the athletic brand lets you choose among a whopping total of 86 styles. We ended up narrowing it down to the low-top Blazers in which everything, from the material (leather, suede, denim, and canvas) to the heel embroidery (leave it as “Nike” or change it to anything you want), is up for grabs. 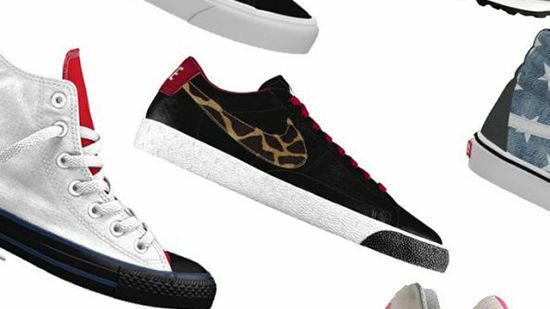 Customize your Blazer Low: $115; nike.com. Reinvent the old-school classic high-tops with colors and prints. We only wish there was a wider range of finishes, like leather or crackled metallics. Customize your Vans Sk8-Hi: $85; vans.com.